See what happens when Cliff gets the travel day? Game Summary: Ronald hit a homer. The end. Sure, sure, sure, Sean Newcomb pitched semi-effectively, K’d a few, scattered three walks and two hits over six, but needed 108 pitches to do it. Yeah, the home plate ump was…different sometimes. But I’m not getting excited about five base runners and 100+ pitches over six meager innings, kids. Charlie Culberson hit a triple at one point, which in no way justified starting him. Shane Carle started the string of mostly effective – I’m looking askance at you, Vizzy – relief pitching. Every time he comes in I shout “CAAAOORL!!! in my worst Rick Grimes impersonation. Ozzie Albies should probably be awarded “the save” for his glove work in the ninth. Far more useful in sealing the win than Vizcaino’s actual pitching. All that said, it was only the baseball team formerly known as the Devil Rays. Seriously. Kevin Kiermaier is on the DL, Mallex Smith and his future HOF career only got a pinch running appearance. The best hitter on the field for the home team last night was Wilson Ramos. It was only the Rays, man. Aside from Ronald’s blast, the offense was shut down by Blake Snell, who is surprisingly not a bro-country singer. Snell pitched more or less precisely as effectively as Newk on our side, but did not have Ronald on his. After Snell, a guy named Ryne Stanek threw a couple of shut down innings of relief, which was unexpected, because I swear I saw that guy slangin’ weed out the back of a beat up Impala down the block, two weeks ago. Jesus kid. You make a minimum of a half mil a year. Pay a professional to cut your hair, son. Jonny Venters pitched the ninth for them. Threw 94 with movement. Didn’t pop a ligament this time. Yay Jonny Venters! Moving forward, Julio toes the rubber against something called a Ryan Yarbrough tonight, but let’s be honest, I’ll be watching soccer. United carry a seven game unbeaten streak and the status of “best team in American soccer” into their mid-week match against western conference leaders Sporting Kansas City. They follow that up with another weekend tilt in the Benz, this time against regional rivals and home squad of MLS’s version of Bryce Harper’s Douche-hair, Dom Dwyer. Orlando City. It’s funny, because we all know Orlando isn’t a real city. Um, otherwise? Matt Ryan recently got even more richer, in both cash and receiving options. The Hawks Tanking Season #1 is mercifully done, and if you didn’t think it was a reasonable thing to do, check out the results of the playoff series between the #1 ranked Toronto Raptors and the #4 ranked Cleveland Cavaliers. The NBA regular season is meaningless, and if you don’t have a top 5 player on your roster, there’s no point in even trying. My buddy Alan is coming home for a visit week of May 19, so there’s a reasonable chance I’ll be at SunTrust one day that week at least? I don’t know, man. It was only the Rays. Did you know there’s now a direct API feed on the WordPress dashboard to send tweets? One assumes via the official BravesJournal account. I’m not sure Cap’n Jorts has thought through me having access to this yet. If you tweeted out some jorts photos, Rob would probably appreciate it. I’m old enough to remember another time the Braves won 1-0 on a homer by a young star coupled with some stellar defense. From the previous thread: I’ll probably end up in the left field seats, and I’ll be in a red striped Braves polo, blue-grey shorts, and I’ll be with my lovely bride who is blonde, and my sister and brother-in-law are guaranteed to be in Braves attire as well. We’re all in our late-20’s, early-30’s (well, I’m in my early-30’s). Sometimes I am loud. You brought this on yourself, Rob. I haven’t worn jorts in at least a few days, so I feel like I should be getting a pass here. Newcomb has turned a corner, it seems, at least for now. I’m not an expert on PITCHf/x, but it looks like he’s gone from pitching off his curveball to more off of his fastball and change-up, and that seems to have made a big difference. Acuna, Camargo, Albies, Soroka, Newcomb, and Folty all coming up big this year will keep things interesting deep into the season. Otis Nixon’s catch continues to be one of my favorite, if not my favorite, catch in Braves history. I don’t think it gets any better than Gary Matthews Jr.’s catch, however. I’m convinced Winkler is the team’s best reliever. Newcomb limited the Tampa Bay Rays to two hits in six innings of a 1-0 win Tuesday night at Tropicana Field, becoming the first Braves pitcher to allow two hits or fewer in consecutive scoreless starts of at least six innings since the legendary Maddux did it June 27-July 2, 1999. I think Gohara really benefits from some low-leverage outings in the pen for a little while. It’s weird to say you’re calling a guy up to the big leagues to take pressure off, but I think that’s what happens. He’s either in AAA with the pressure to pitch well in long outings to make the big club, or they just call him up and bury him in the bullpen for a little while to let him get his work in. He’s been traded, gone from A+ to the major leagues in a season, father passing away, weight gain, injuries, and losing a starting spot he probably felt he had. It’s probably been tough on him. His mom is ill, as well. And to be clear, the phrase “father passing away” doesn’t really do full justice to the emotional trauma for Gohara. His father died in his arms, in the car, as they were rushing him to the hospital. @8, I am, too. I have Minter and Vizzy on my fantasy baseball team. Our league counts both saves and holds, so I drafted the Braves closer and his handcuff. That said, I think Winkler is the one with the goods. He’s doubled up on Minter on WHIP and Ks, and has been slowly getting more responsibility in the relief rankings. Still, Minter has “Future Closer” stamped on his forehead, and Vizzy is “Current Closer” until further notice, so my hands are tied in finding a place for Winkler, it seems to me. Weren’t we agitating to use the “best reliever” in non-save situations earlier? Winkler is still a FA on our fantasy league, and I’d be interested to see when someone actually picks him up. I think it’s going to be hard to slide into the closer’s chair, but I don’t care. How he’s being used has been tremendous, and Snit is either lucking out that he’s incorrectly using the relievers correctly, or he continues to put the exact right reliever in the highest leverage spots almost every time. Good for us. That’s a big development. It seemed like he was either trying to embarrass hitters with the curveball or blow them away with the fastball. If he’s pitching off the change, the fastball looks even harder and the curve looks even more deceptive because the velo makes it contend with the change in the hitters’ mind. Would just love to see a few SPs turn the corner this year. We need it. Per Bowman, Gohara’s not likely to be in the majors for an extended period, unless he earns a rotation spot. He’s with Wisler, Sims, and Fried on the long-reliever shuttle back and forth from Gwinnett. There seems to be a “which one is not like the others” with the list of four pitchers there. 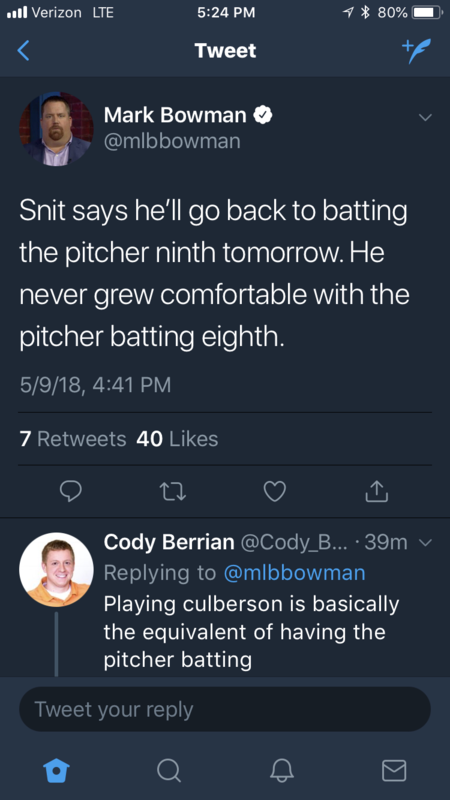 Newcomb may be our ace. I know it is foreordained that Ohtani will win ROY and possibly MVP, batting title and Cy Young in the AL However, just for grins, are Newcomb and Albies still considered rookies and eligible for NL ROY honors? Less than two weeks and just 40 batted balls into his career, Acuna has generated the top five readings and seven of the top eight. The LOLMets batted out of order and it cost them a double. would imbue any locker room with a glimpse of the macabre. 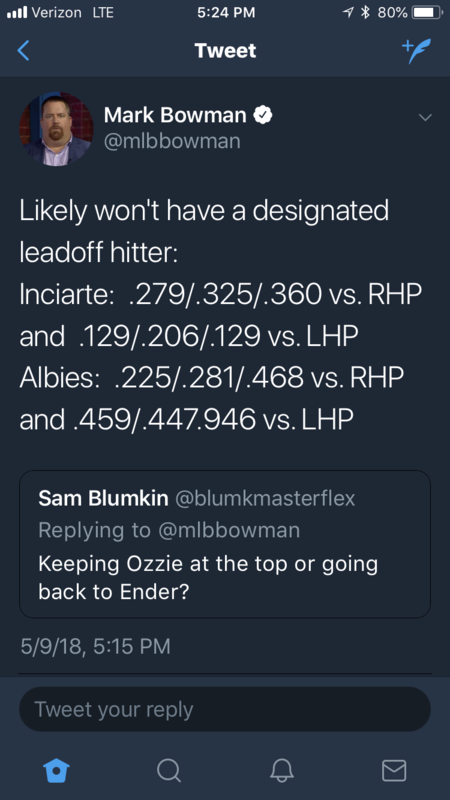 Winkler is 5th in Expected wOBA. It doesn’t rhyme on the repeat, either, son. Touki may not be in AA much longer. 6.1 IP, 0 ER, 5 K’s, 4 BB but people on Twitter say the ump had a tough zone. Don’t look now, but the Natspos are 9-1 in their last 10. Meh. The Mets were 11-1 once. Matt Adams has as much WAR as he had all last year already. He’s been such a huge improvement over Zimmerman and their LFs. Their offense has been Bryce, Turner, Adams (right now), and not much else). When Daniel Murphy comes back, they’re going to be in a good spot. And Scherzer already has 2.2 fWAR, and they have quite a few arms in the pen. They’re a good team. I could see the Phils and Mets fading, but Washington will be towards the top, as they should. ‘Candelabra’ I assume we agree on- hard ‘a’ ending. ‘Macabre’ has apparently proved beyond ya’ because it’s last letter is ‘e’. Those of us who have studied 15th Century Middle French will be appalled if you would pronounce it ‘makabree’. Which is what you are implying.The ‘e’ is silent. Heaven help you. ‘Makabra’ is what is required, the ‘a’ soft. Which rhymes with candelabra, and ‘Danse Macabre’ which started it all. Enjoy the futebol tonight, Sam. A breath of fresh air will work wonders, son. Or was it Pachez/Liberachez that bothered?! in a large yellow ship that blinked as it twirled. It rounded the moon and entered our sky. We knew they had come but we didn’t know why. the ship slowly moved out over the ocean. for transport back home to their galaxy. The tube then sucked up the clouds and the air, causing no small amount of earthling despair. With nothing to breathe, we started to die. “Help us! Please stop!” was the public outcry. Pache rhymes with bash, not Apache. I know damned well how to pronounce macabre. But there’s no “bruh” at the end. Newcomb and Folty are our best starters and Carle and Winkler the best relievers (by WAR). Truth is that those four make up most of our positive pitching WAR in total. Newcomb is now among the top 30 in the league overall in WAR. You wanna know what our pitching could look like? Look at the O’s Ace’s 1st inning line last night (Dylan Bundy) – single, HR, HR, HR, walk, walk, HR then out of game. I think it doesn’t get worse than that. Actually Pache is pronounced “Posh-ay.” Still doesn’t rhyme with Liberace though. I have to tear myself away, regretfully, from this discussion. Tonight we leave en route for Cartagena on a very large ship, to meet with Julio’s people. Items on the agenda include awarding him the first Best Bunter trophy, discussing an extension, congratulating the parents for their son becoming the Honorary Mayor and formally opening his fourteenth Starbucks around Julio Teheran Square. Then on to the Canal where these monsters go up and down in the night, very slowly, and every ten year old boy is called Mo and works assiduously on his ‘kuttah’ . I have been told to ignore no one and deny any association with ‘Koppee’. The responsibility is huge. I thought that part of the fun with these poems was to attempt to force rhymes where they don’t exist. I’m pretty sure that has been written here if not included within official guidelines. Check it out, blazon, you’ve got lurker fans. What’s next, a book deal? Oh! KK = Kevin Kiermaier! And here I was reading yesterday’s entries trying to figure out where Kenshin Kawakami fit into the Rays’ plans. Wait. They were supposed to be “fun?” You people are very strange. Christian Pa-chay … emphasis on the first syllable. Might be good to get used to saying it right, on the 0.005% chance he plays for our big league team. @46 Except that it worked and it made logical sense. Rob, I’m at the Trop. Are you? My dad and I got press level seats. This stadium is as quiet as a library; it has the calm of a mausoleum. There are also some odd landmarks, infrastructure in the most in your face places, like a giant industrial freezer that, or a giant trash elevator that is at the foot of the escalator to our seats. So very unusual. Anyway, if you’re in the stadium, hang a right at the giant trash elevator and go up the escalator, we’re in section 214. Great view of the field! Austin Riley up to Gwinnett. Riley’s off to a good start in AAA. How good does he have to be there, and for how long, to get called up to ATL before September? Bowman confirmed that the lineup construction of late was AA’s idea. So far Julio is really locating that 88 mph fastball. Man, we’re all over the place with Pache. I thought it rhymed with sashay. But yes, Americans usually rhyme the danse macabre with corn on the cob. John, yes! In section 147. Where are you? Speaking in generalities, I love talking Braves baseball, I’m abivalent towards poems, but I tire of breaking down pronunciations. Just my two cents. Fair enough. I come for the accountant fights. Mrs. Copenhaver loves Nick Markakis. It’s unhealthy. So you can imagine her delight when Kakes went yard. Every time he does something productive, let out a loud, quick, “Nick!!! !” in unison. Alex (I think it was Alex) was right several threads ago when he said something to the effect that Markakis has established what he can do offensively and we should not expect more than that. So, Nick will regress, right? In the meantime, let’s enjoy this while it lasts. Or maybe this will be one of those anomalous seasons like the year Brady Anderson hit 50 homers. Tampa Bay looks a lot worse than a 15 and 18 team. Of course it doesn’t help that more than half of the 1000 fans at the ballpark seem to be cheering for the Braves. Or maybe a better analogy would be 1973 when Dave Johnson hit 43. 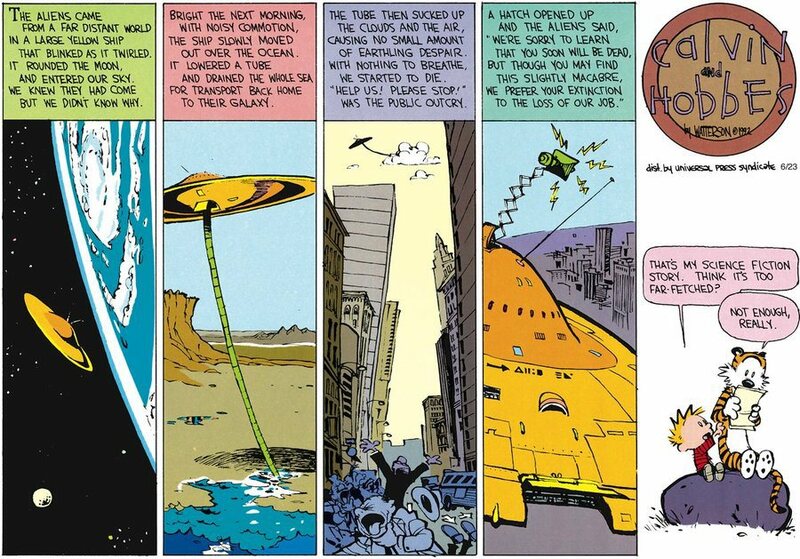 @ 34 – I read a lot of Calvin & Hobbes as a kid, including that strip! and as it was the first time I remember encountering “macabre,” I still think of that strip every time I see/hear the word, including just now before I scrolled down to see you’d posted it! Bill Watterson v. much taught me that word (along with several others, I’m sure). In case no one noticed, Julio had 7Ks and ZERO walks. His ERA is now 3.14 and should now qualify to be part of the discussion as to who is the best pitcher on the team. I’m trying to figure out where Mike Trout got the Nick Markakis costume. And why would he want to play in games for the Braves. One has to note that Nick’s defense has been better this year, too. Maybe it’s Bryce in disguise trying to get a feel for what playing for the Braves will be like. It’s his hair. He hasn’t shaved his head yet. He is like Samson but without the part about the temple pillars. “Julio’s hotter then a dancin bobcat”! Where does Joe come up with these comments? !